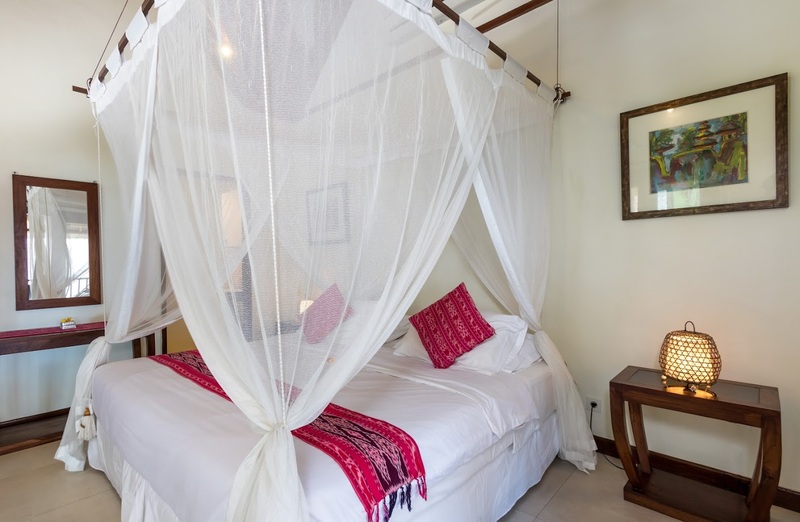 Looking for a luxury stay right by the sea in a peaceful village near Candidasa and all that at an affordable rate? 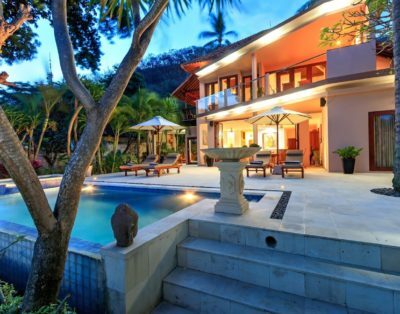 Look no further, this 4-bedroom holiday retreat will make your dream come true! 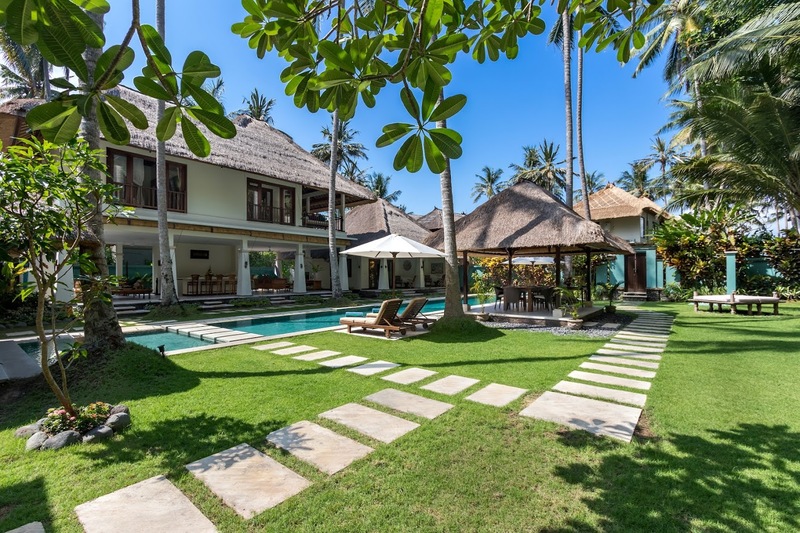 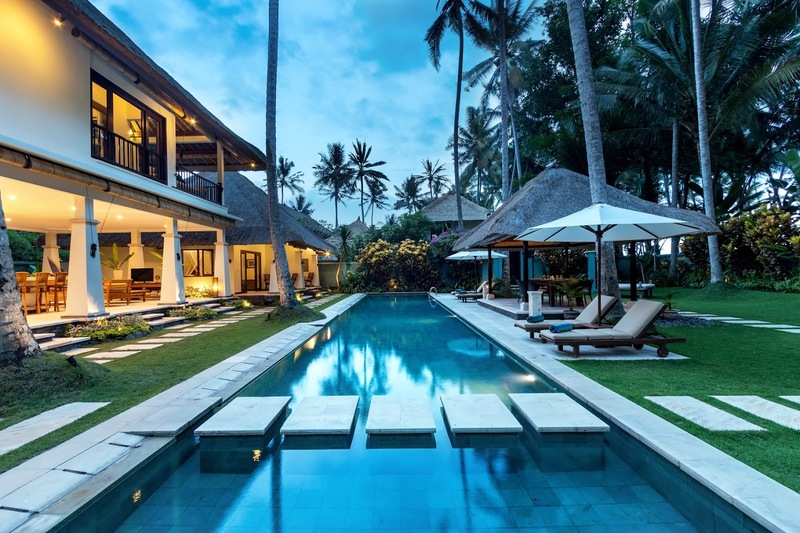 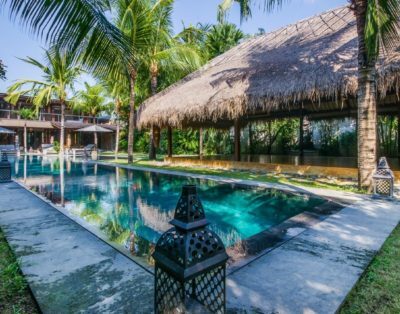 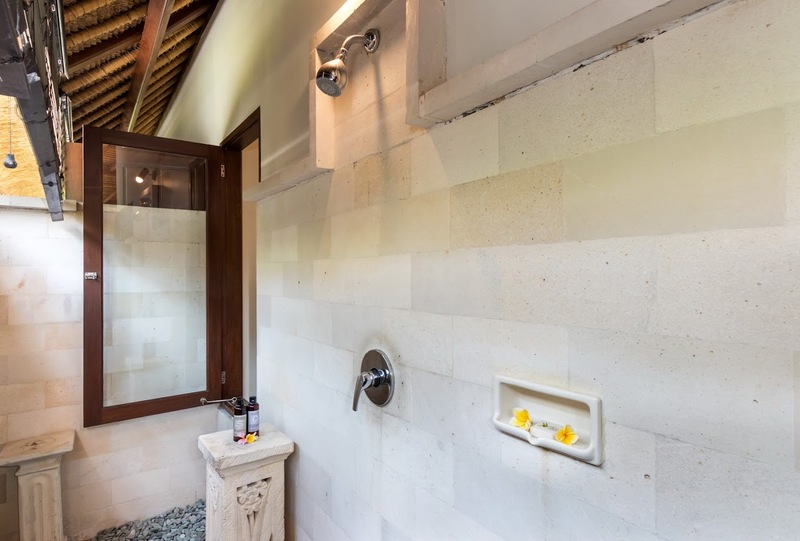 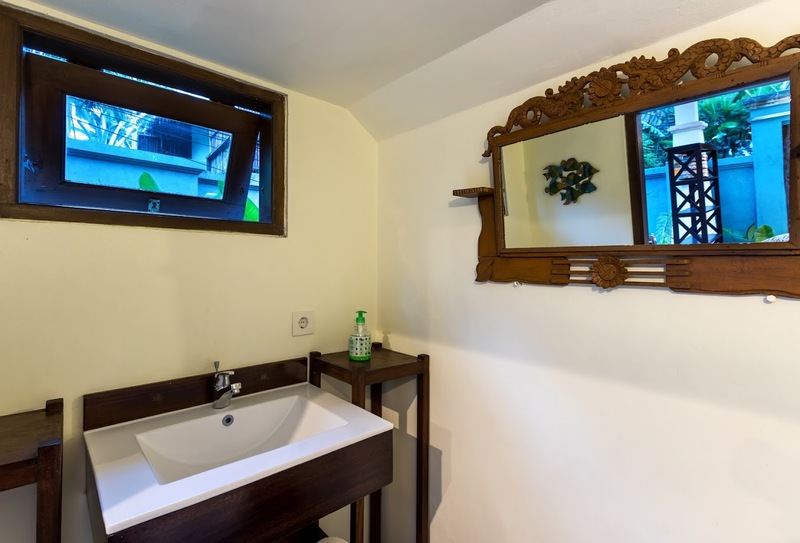 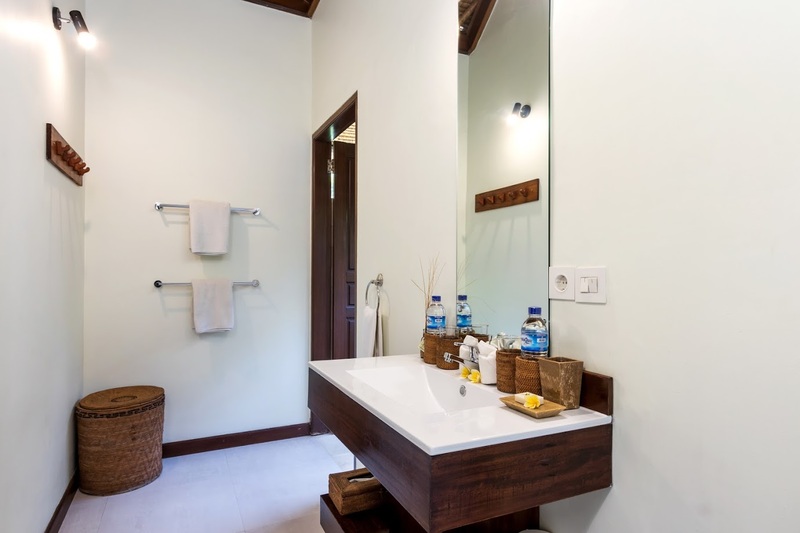 Villa Gils is tucked away in the quiet traditional Balinese village of Mendira on the east coast of Bali island, a place to enjoy tranquility and unspoiled nature. 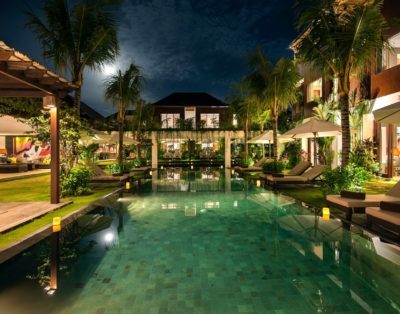 A few minutes driving will take you to the town of Candidasa, where you can go out for dinner or shop a little. 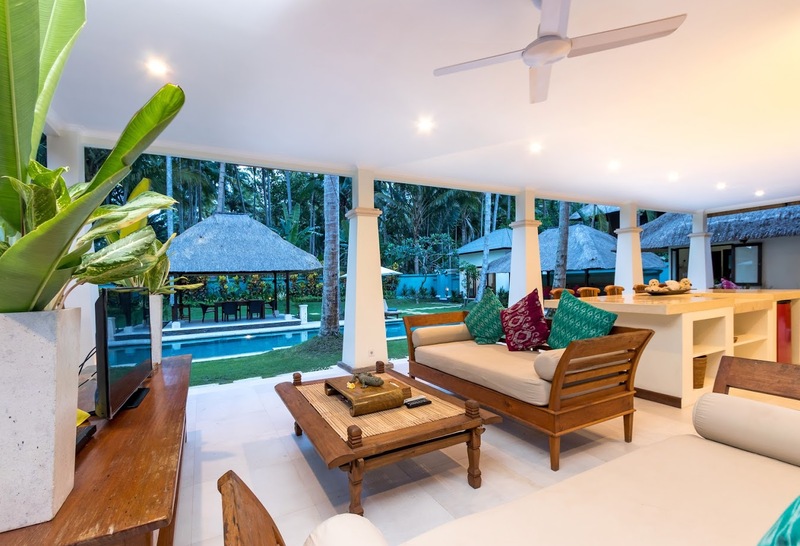 There is no doubt that you will absolutely love your stay at this gorgeous holiday retreat, breathing in the fresh ocean air and lounging to the sound of gentle waves rolling to the shore. 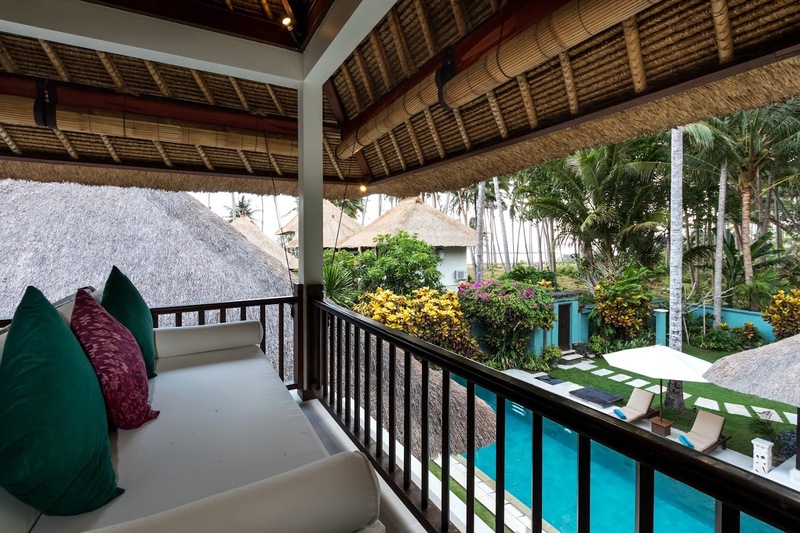 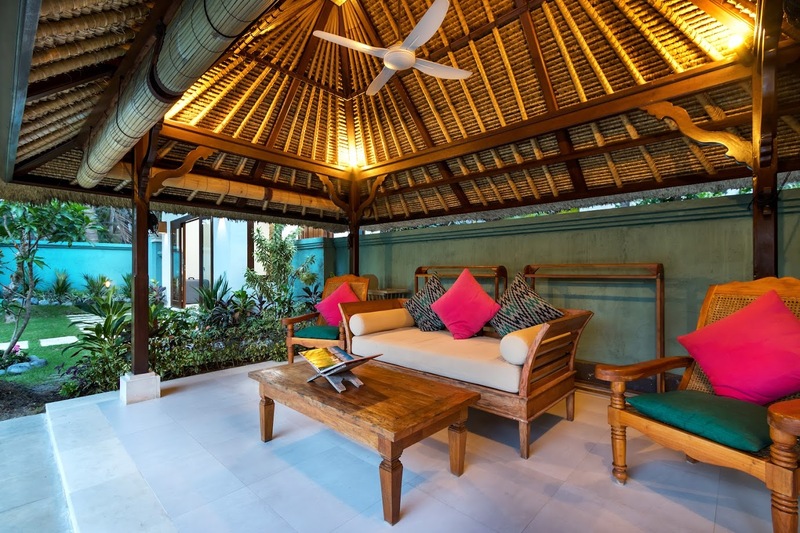 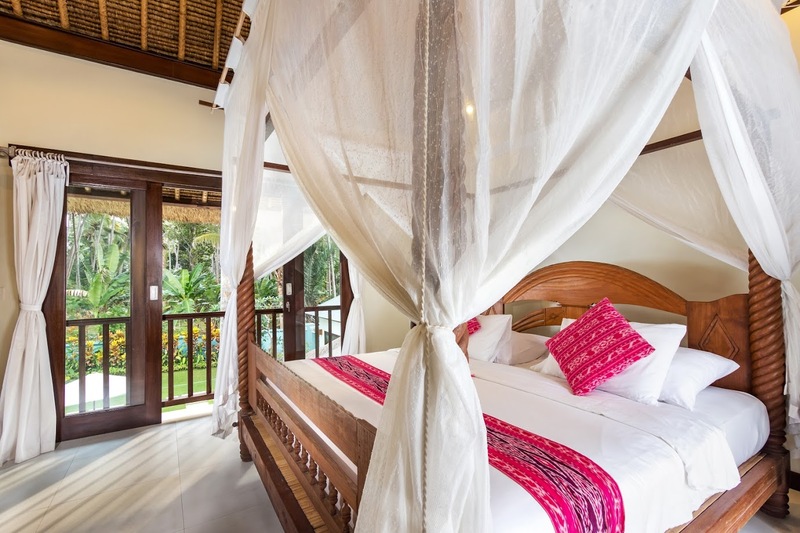 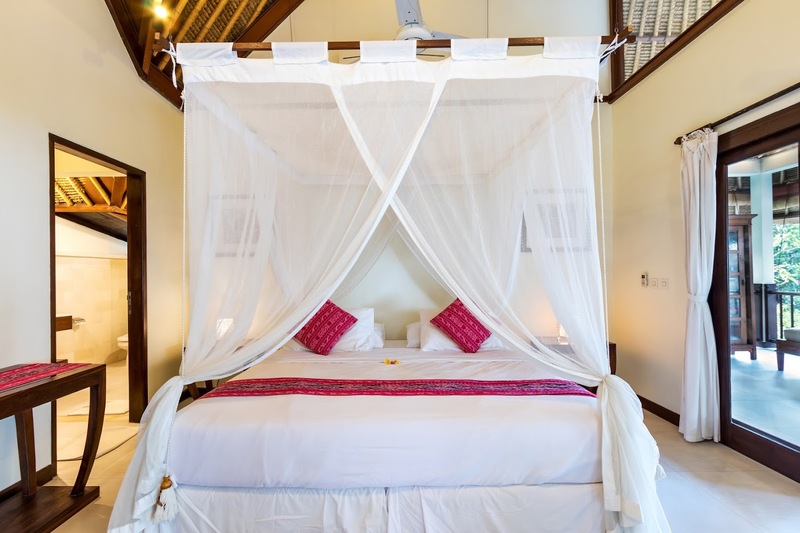 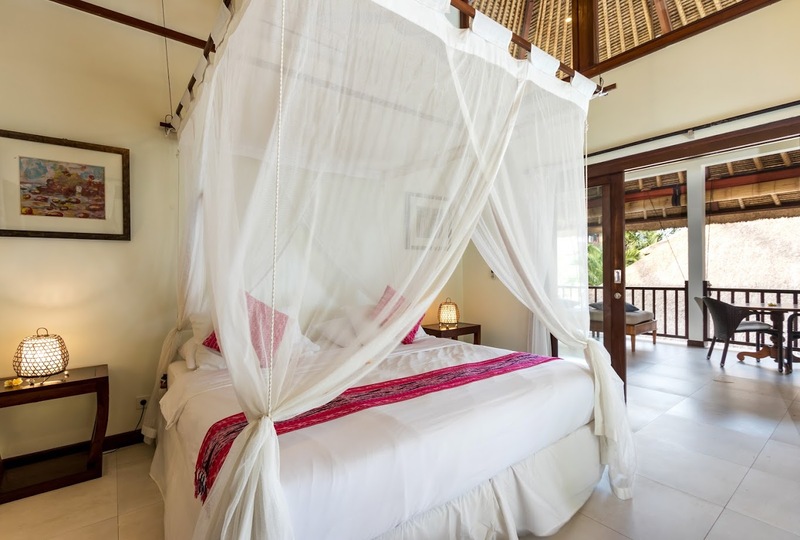 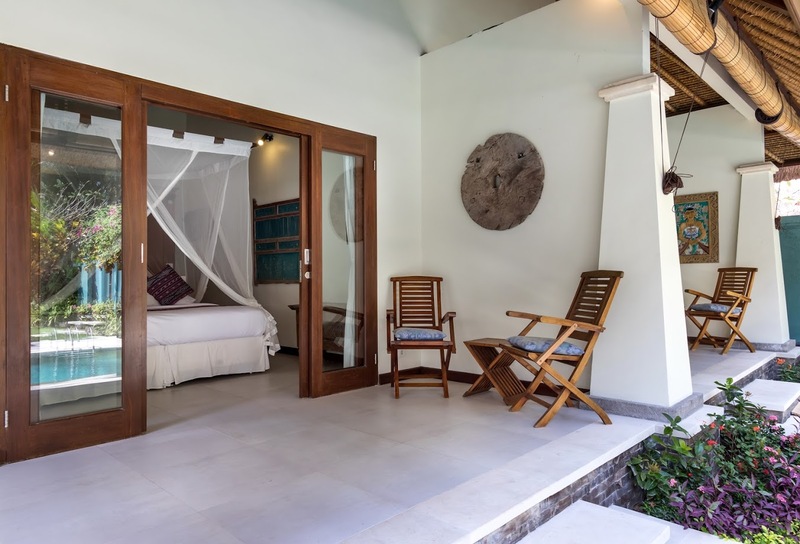 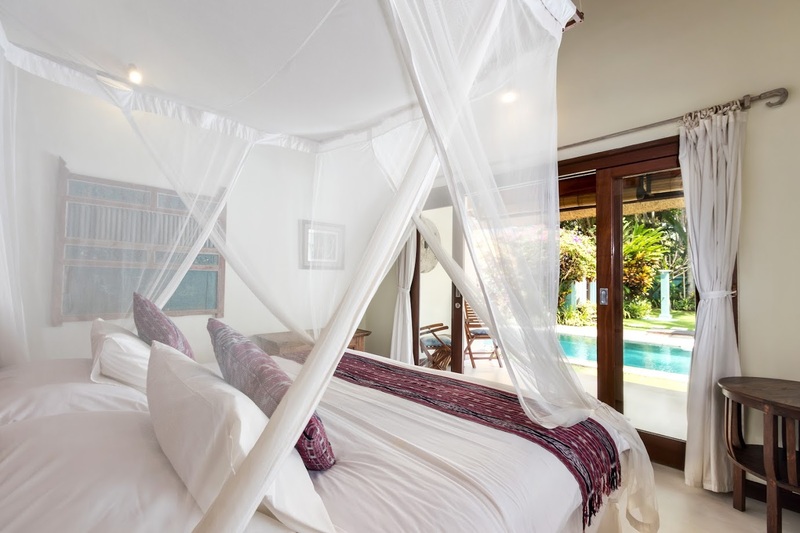 Villa Gils has 4 comfortable bedroom suites where you can sleep to the sound of the sea in air-conditioned comfort. 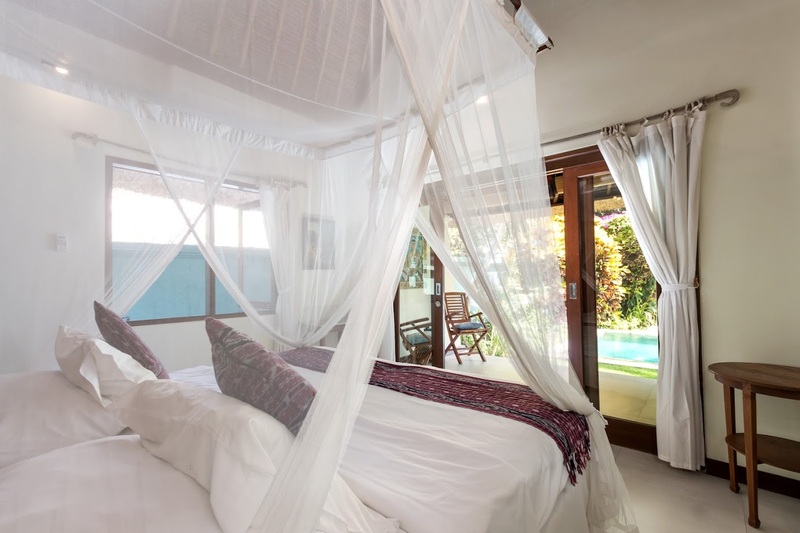 The master bedroom is located up on the first floor, with easy access to the upper ocean-view lounge terrace. 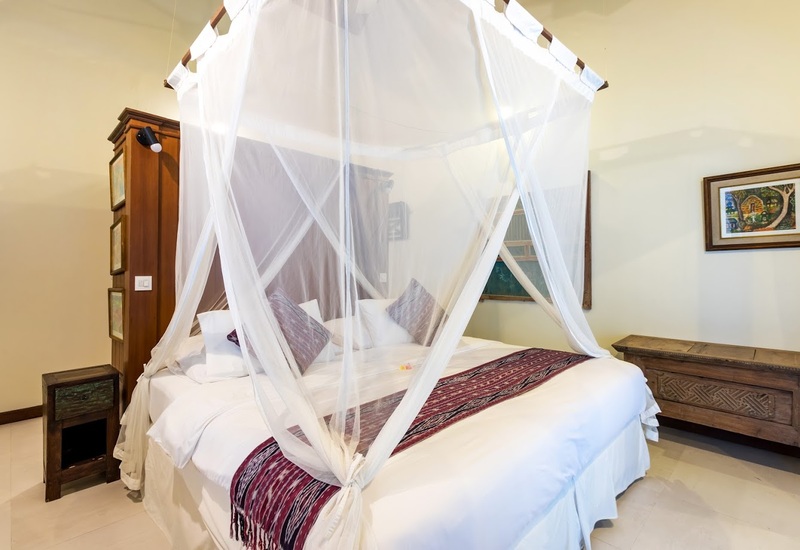 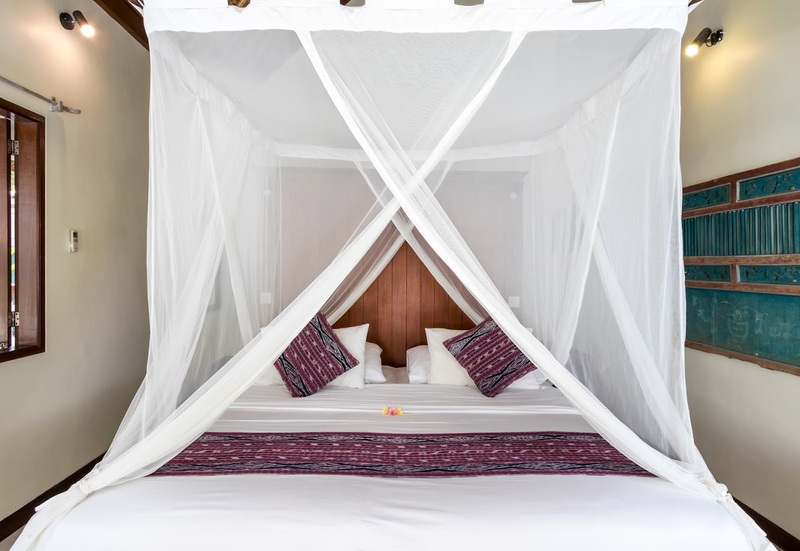 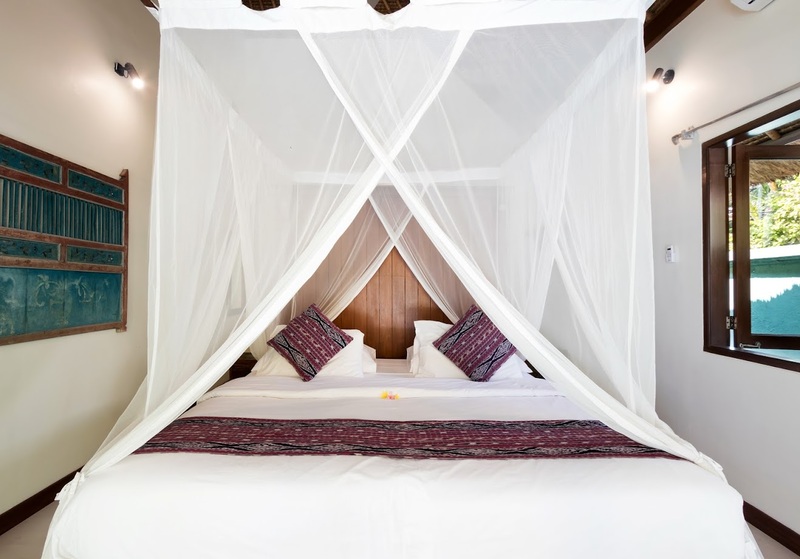 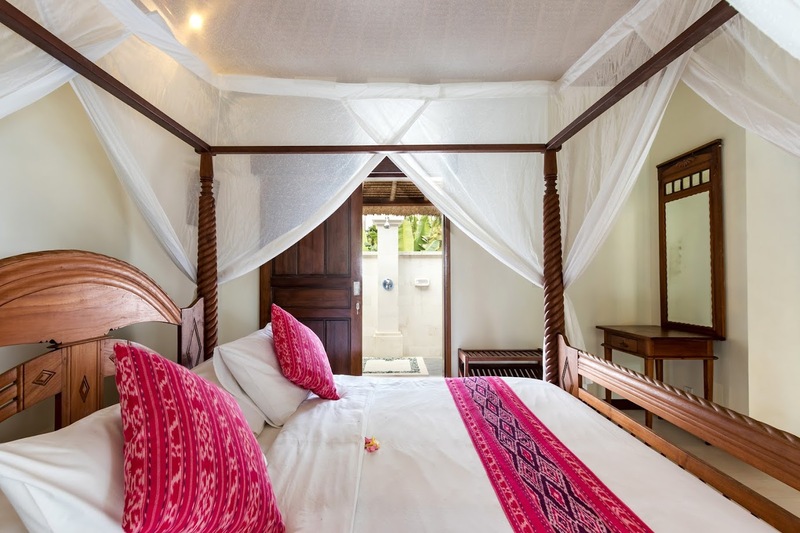 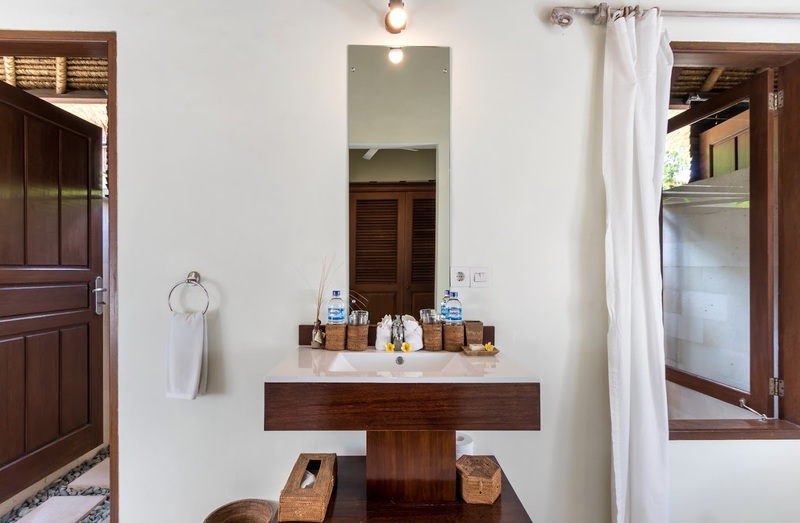 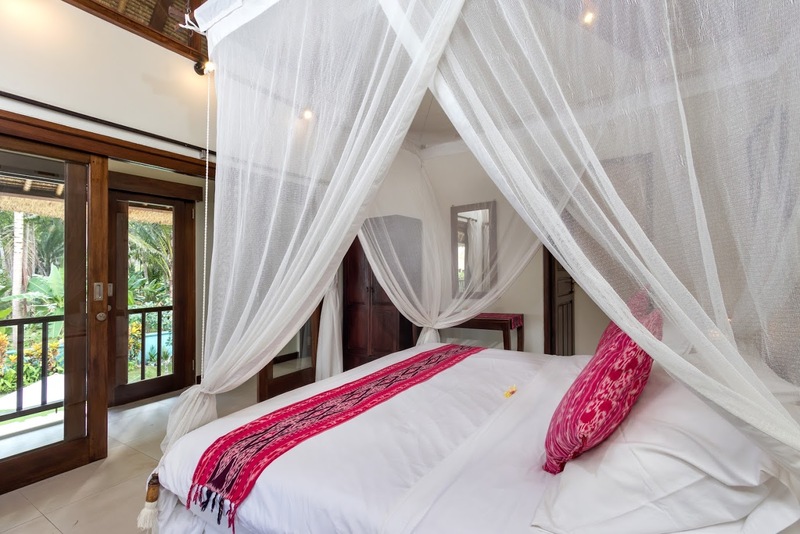 The room is furnished with a romantic canopied four-poster bed and it is adjoined by a private open-air en-suite for bathing and showering alfresco style, embracing the sweet tropical island lifestyle. 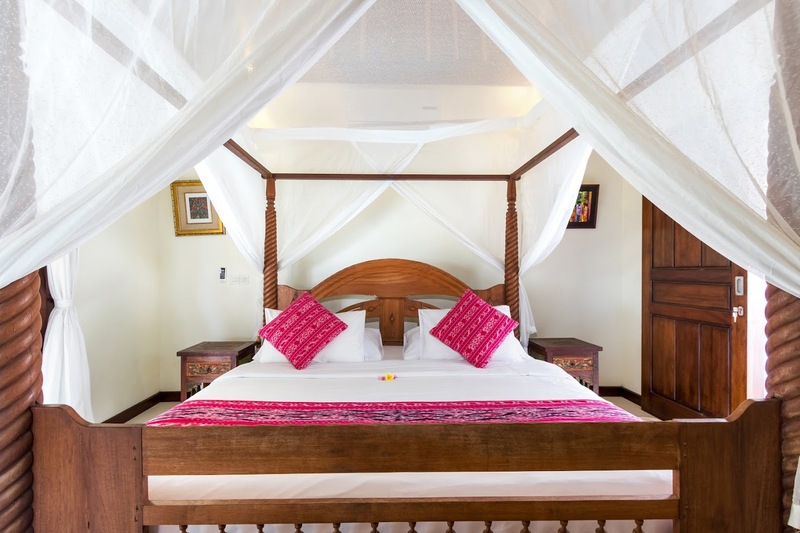 Side by side to the master suite, awaits a family-designed bedroom with twin beds configurable into one king-size bed. 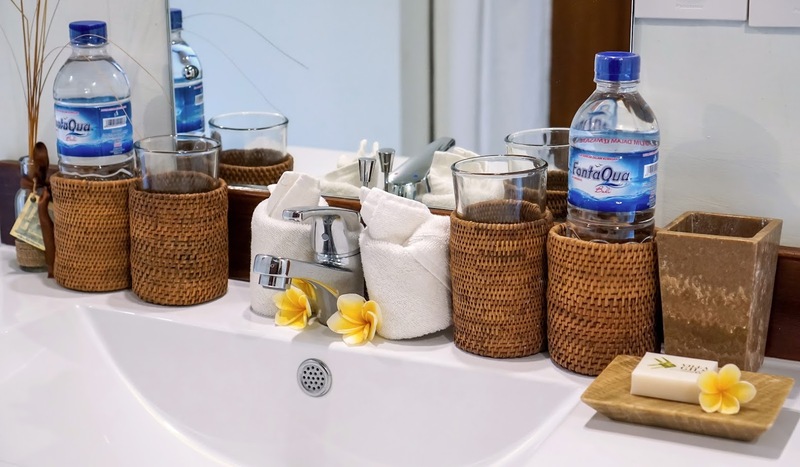 Ideal for parents traveling with kids. 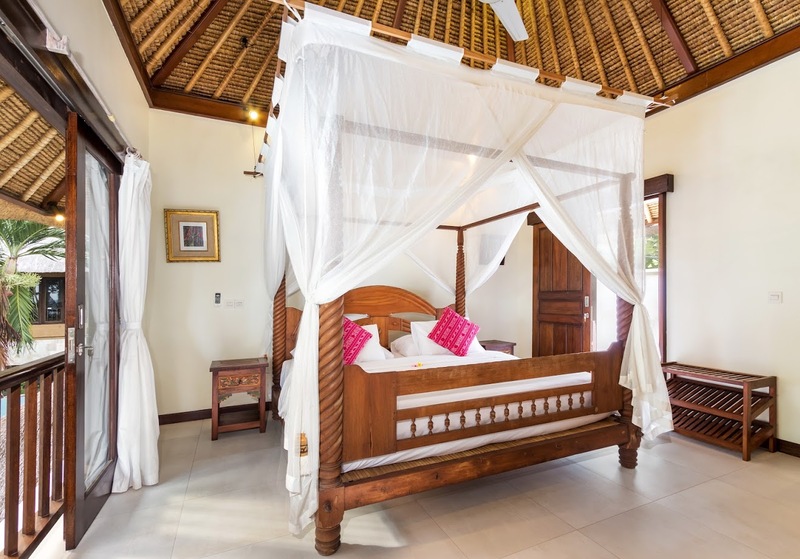 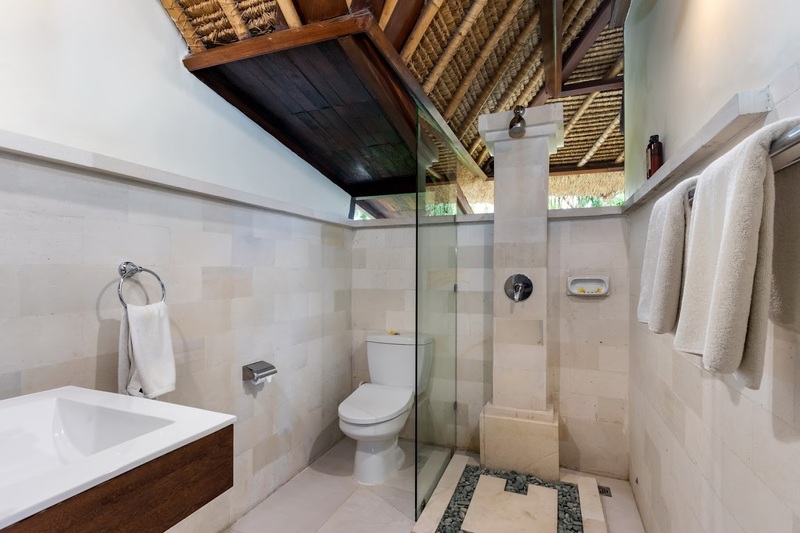 The two guest bedrooms are located together in one stand-alone traditional thatch-roofed building. 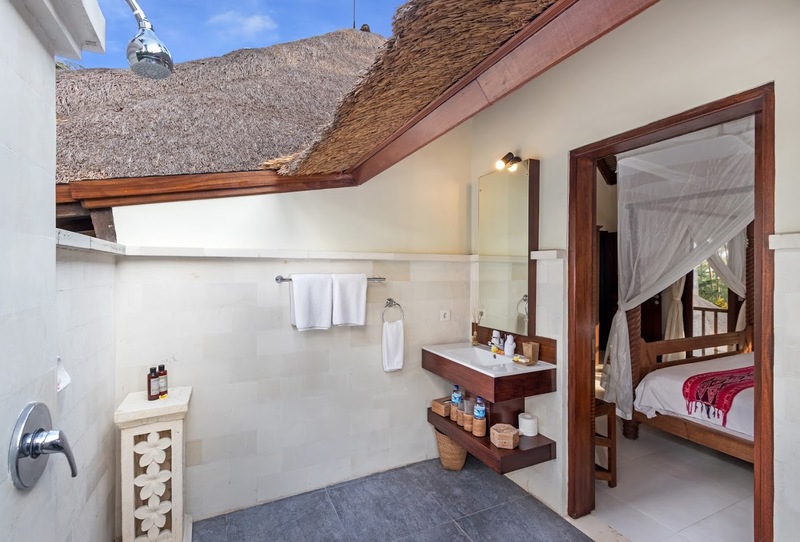 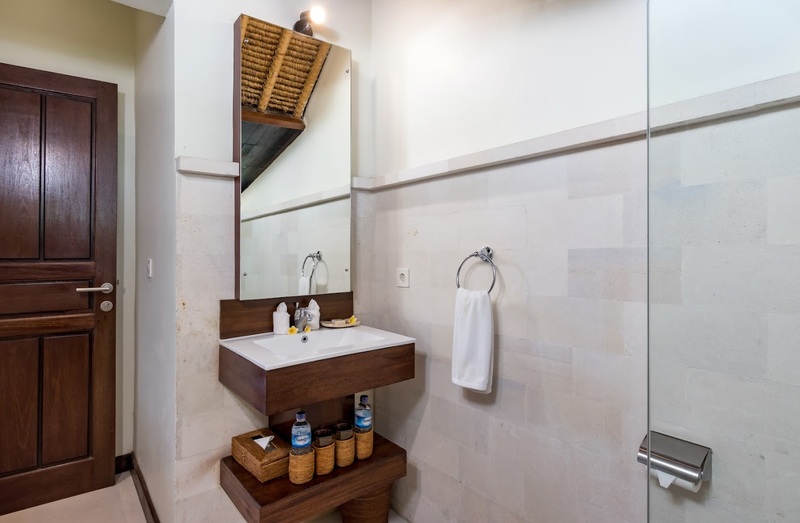 Each bedroom comes with a veranda that overlooks the pool and both has access to a private en-suite bathroom with an outdoor shower. 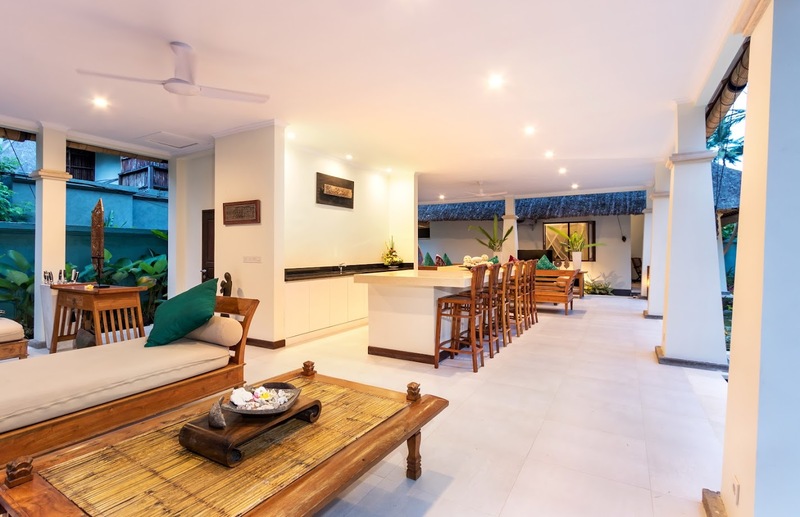 The living room features an airy open-plan design and yet the layout is contemporary with sleek white walls and modern facilities such as a cocktail bar with stools and a satellite-TV with DVD-player for entertainment. 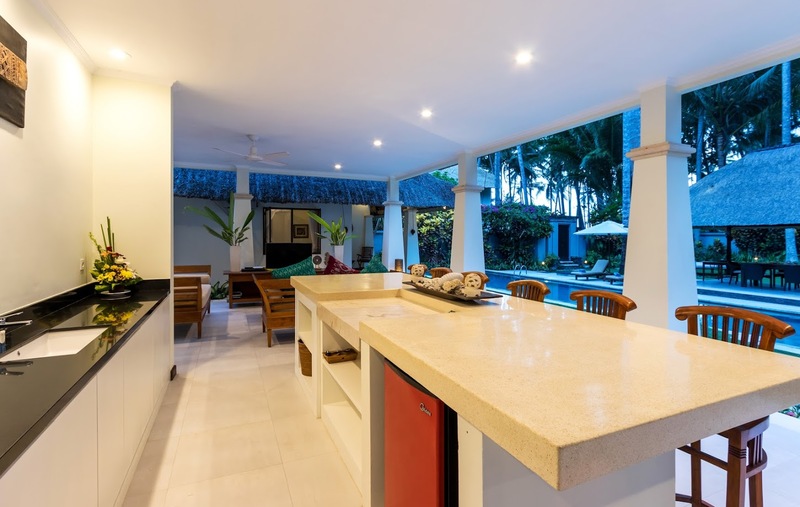 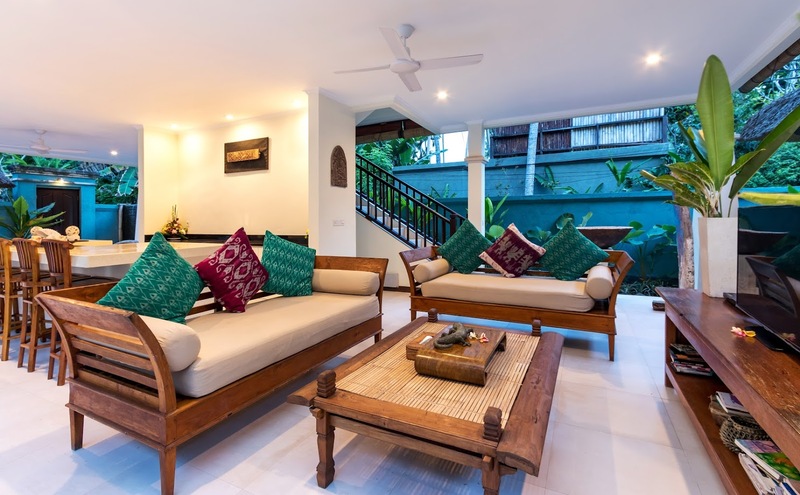 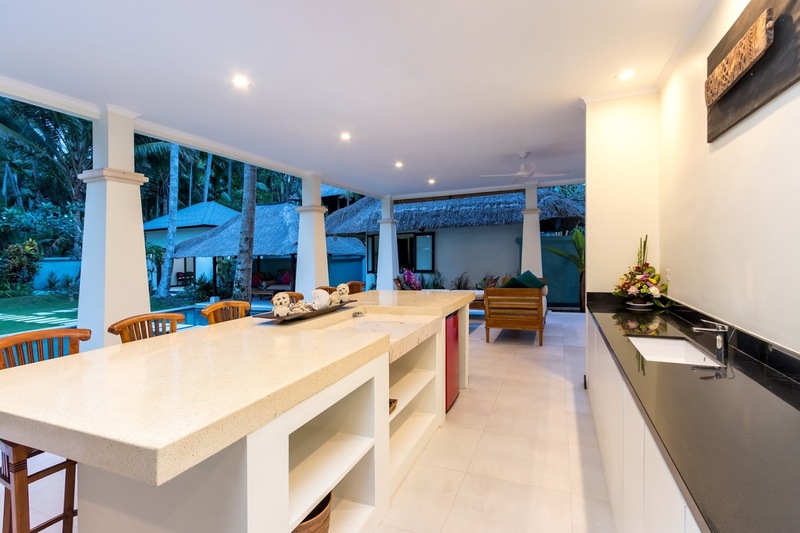 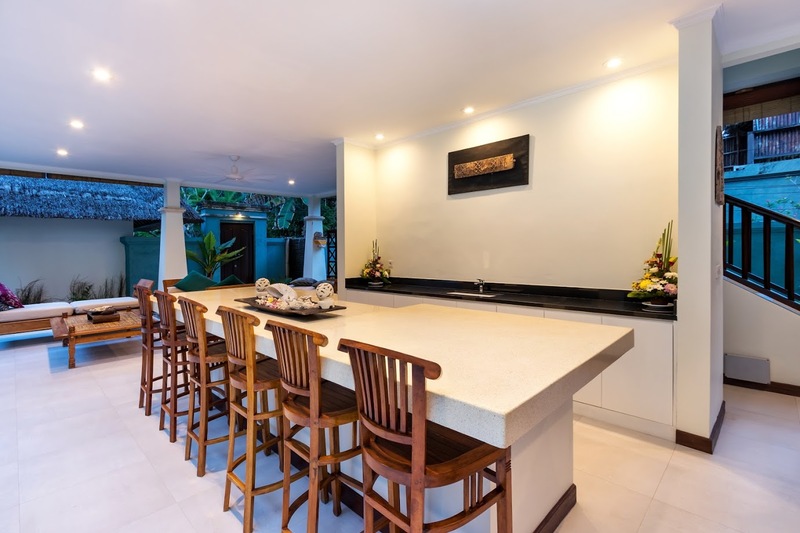 Whether you are getting some snacks from the fully-equipped kitchen, having drinks at the bar or lounging on one of the daybeds or at the sofa sitting corner, you can enjoy the fresh air and the view of the garden. 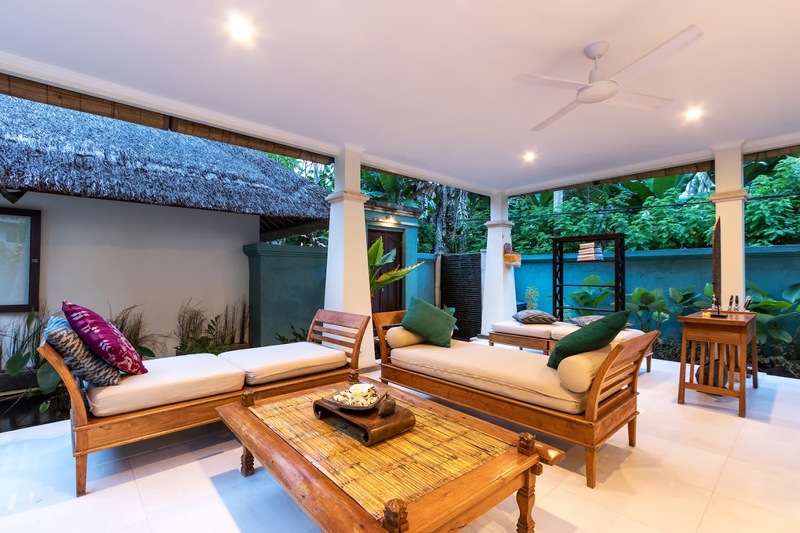 On the first floor of the pavilion, there is another lovely hang-out spot, perfect for sunset drinks to the view of the ocean. 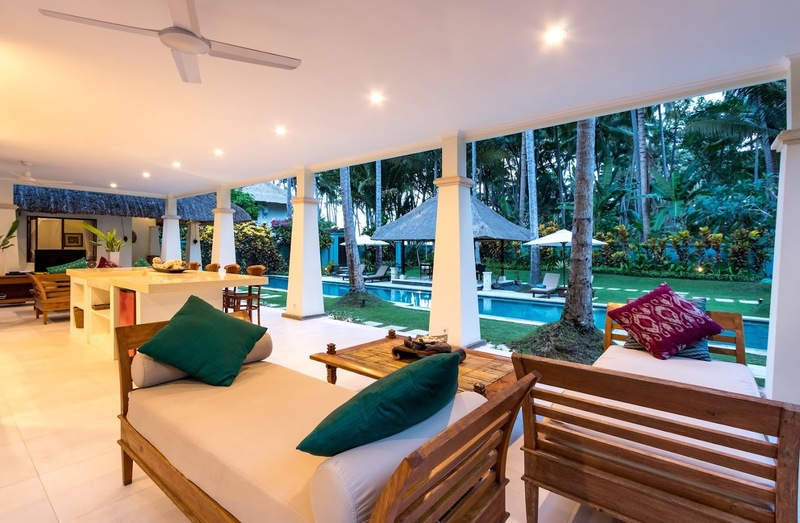 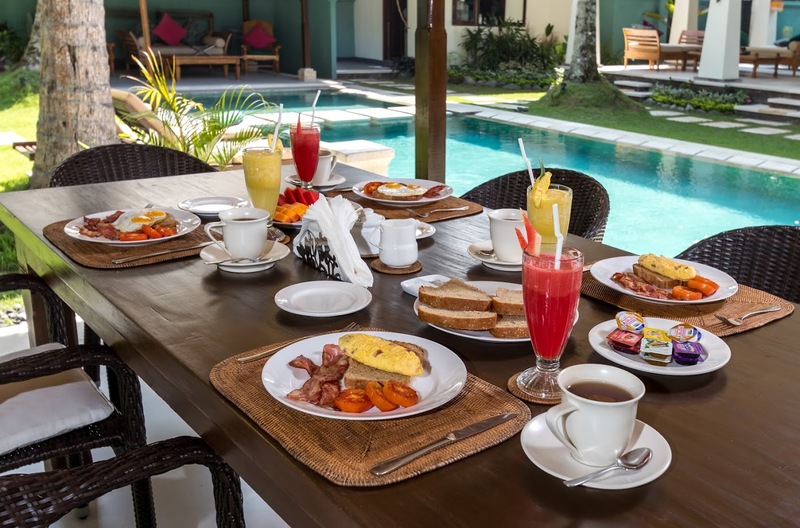 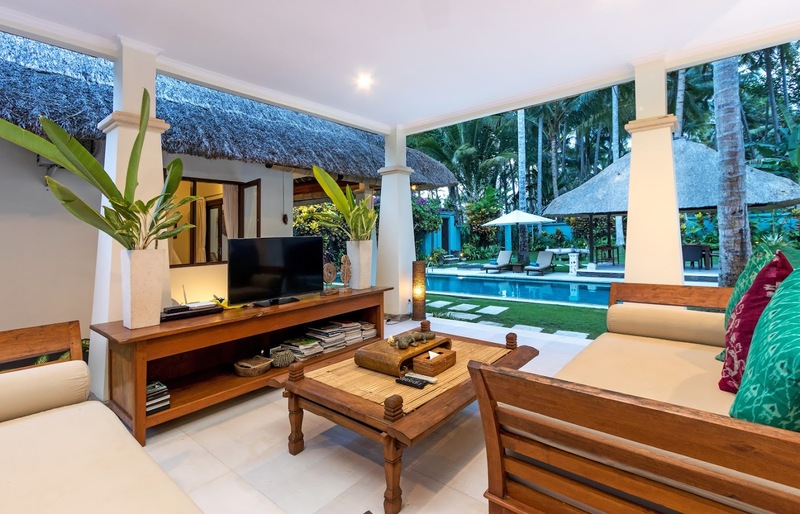 Villa Gils features a large private garden, planted with towering tropical palm trees and flowering plants growing lushly around the manicured lawns and the inviting 25-meter swimming pool. 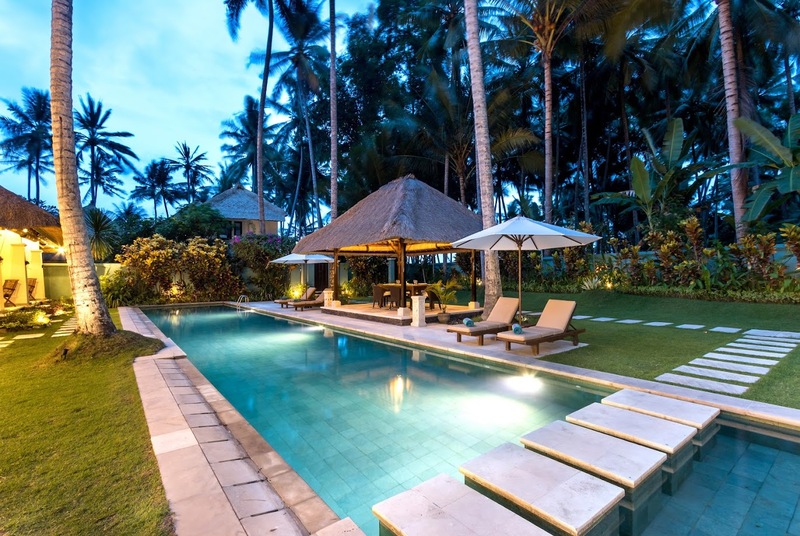 Stepping stones in the crystal clear water separate the deep end of the pool from the shallow kiddies pool, allowing the little ones to safely play in the water while parents can get their daily exercise by swimming some laps. 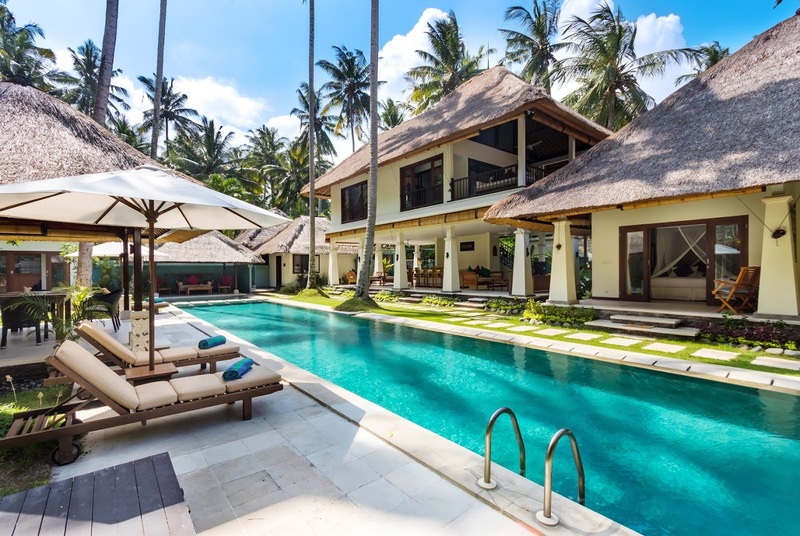 Reclining chairs and large white parasols are placed on the stone pool deck, great for sunbathing, snoozing and reading by the poolside. 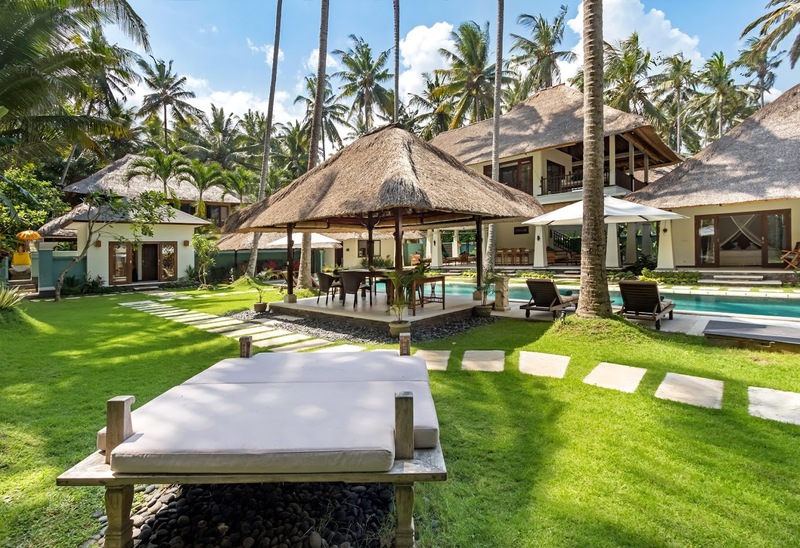 At the shallow end of the pool, sits a traditional thatch-roofed balé where you can sit back and sip some cocktails while watching the kids splash and play. 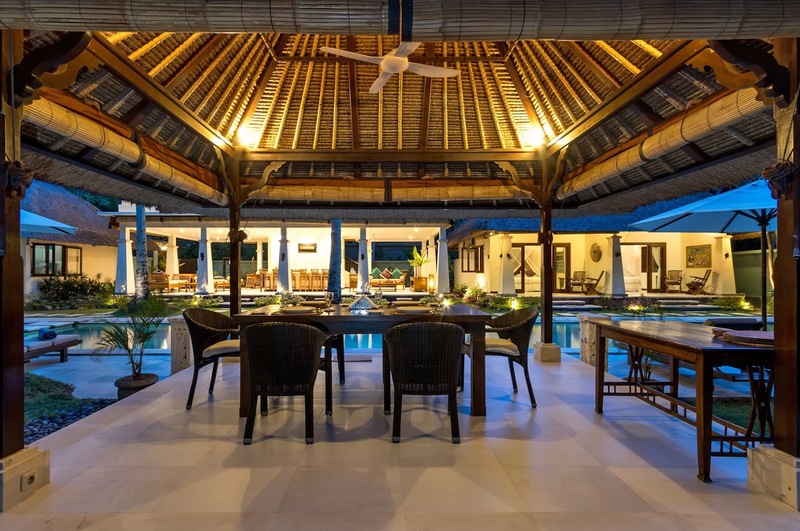 The second thatched pavilion is home to the alfresco dining area, the perfect spot for an early morning breakfast or candlelight dinner. 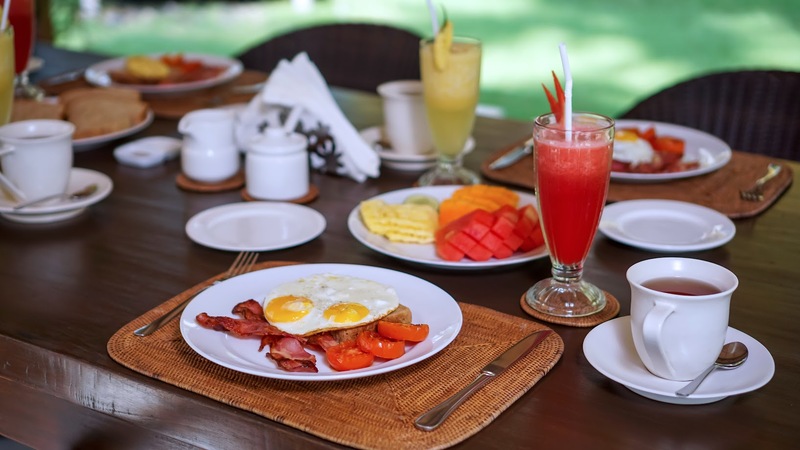 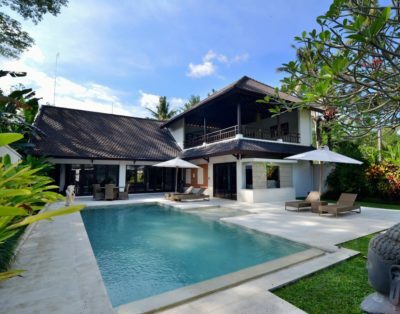 Villa Gils has a professionally trained team of staff looking after you during your stay. 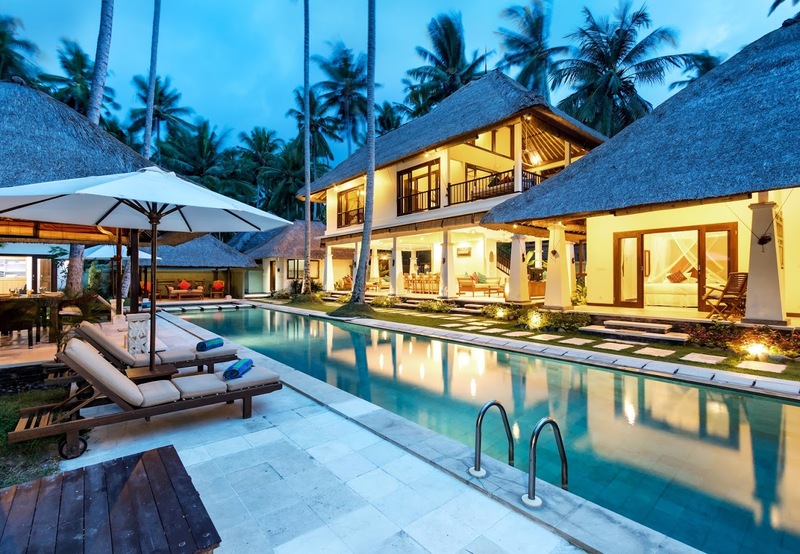 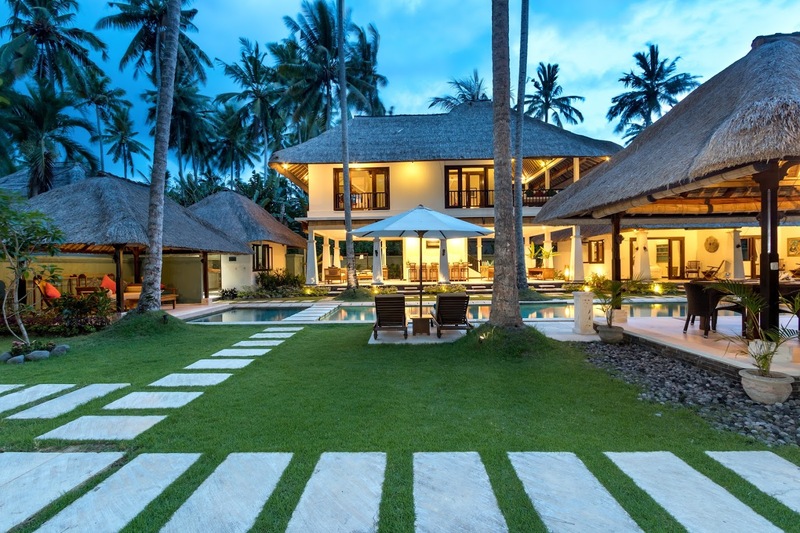 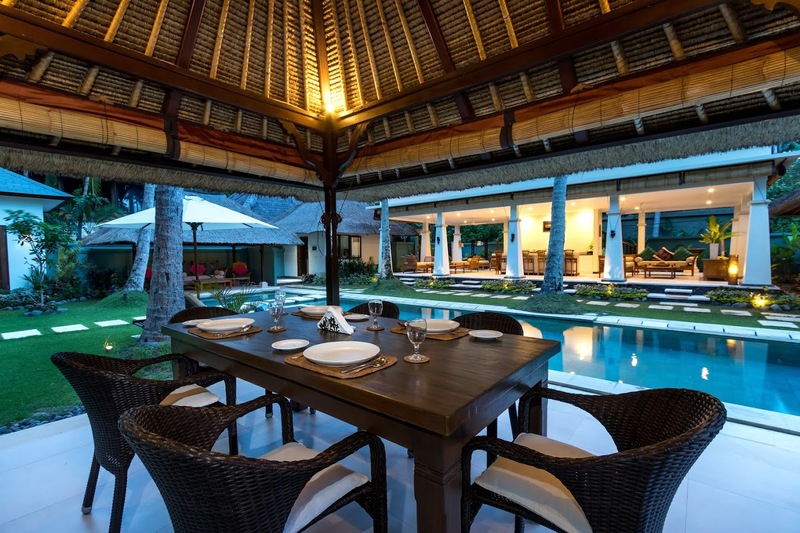 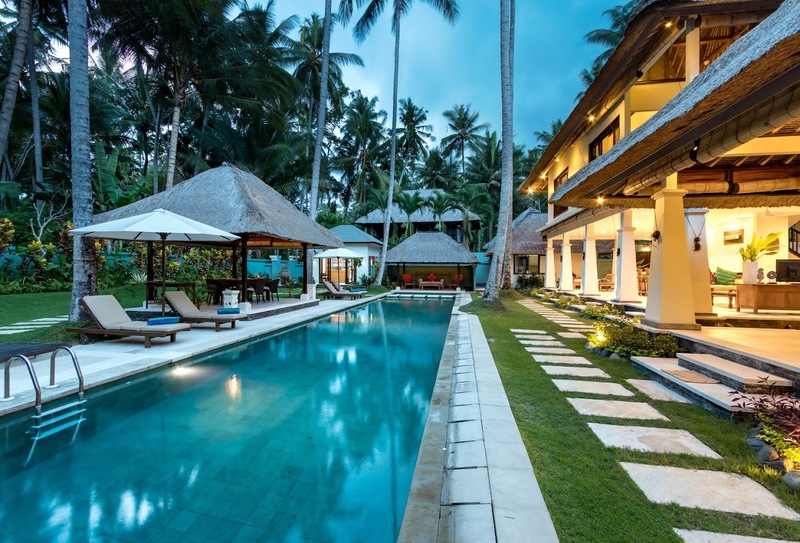 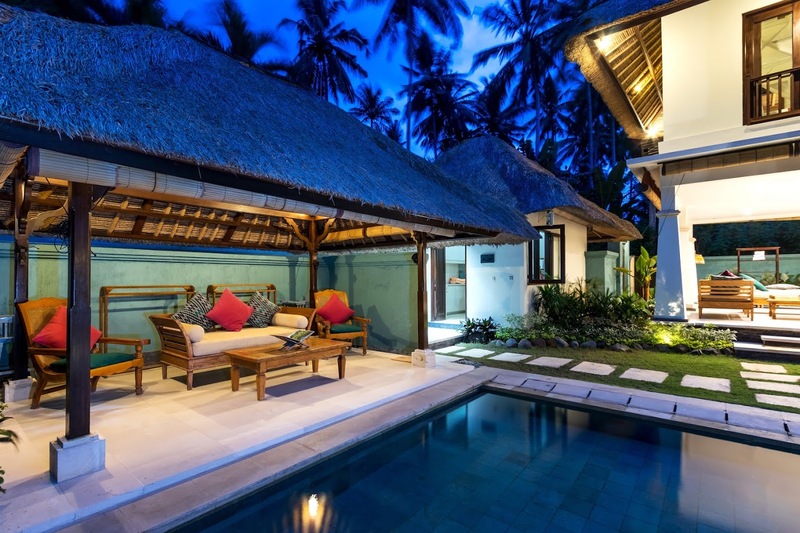 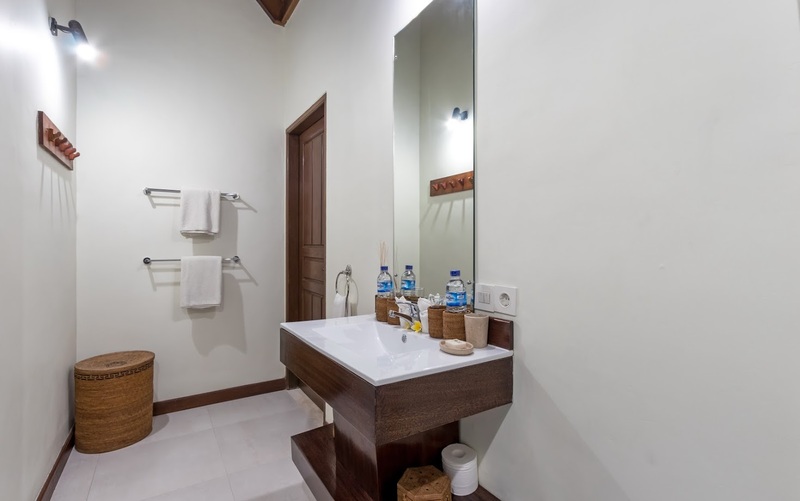 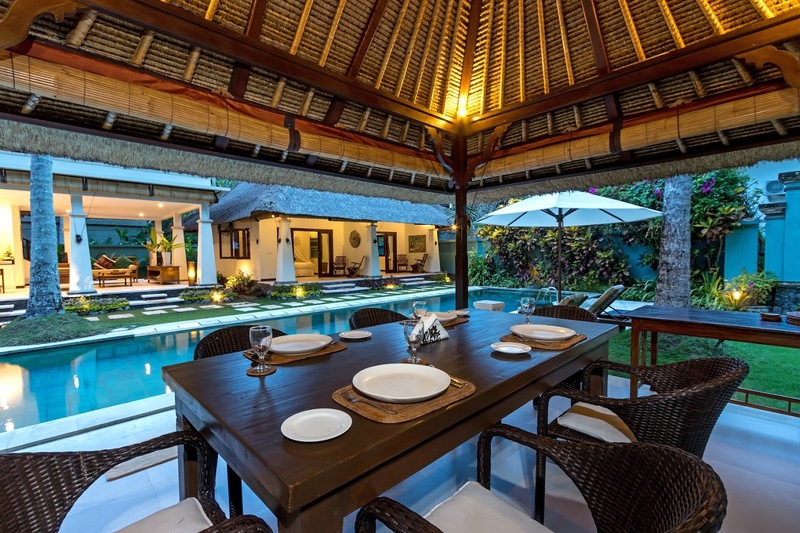 The villa manager Wayan knows everything there is to need to know about the surrounding area and is happy to advise. 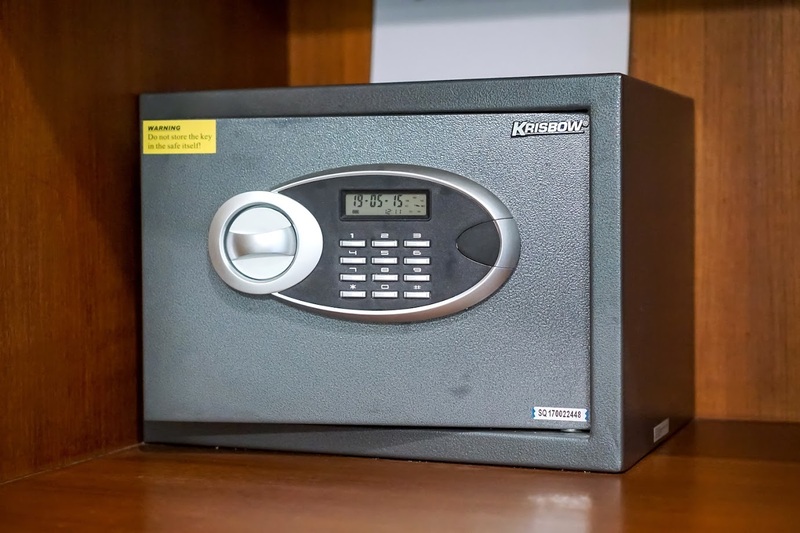 There are butlers, there is daily housekeeping and there is 24-hour security. 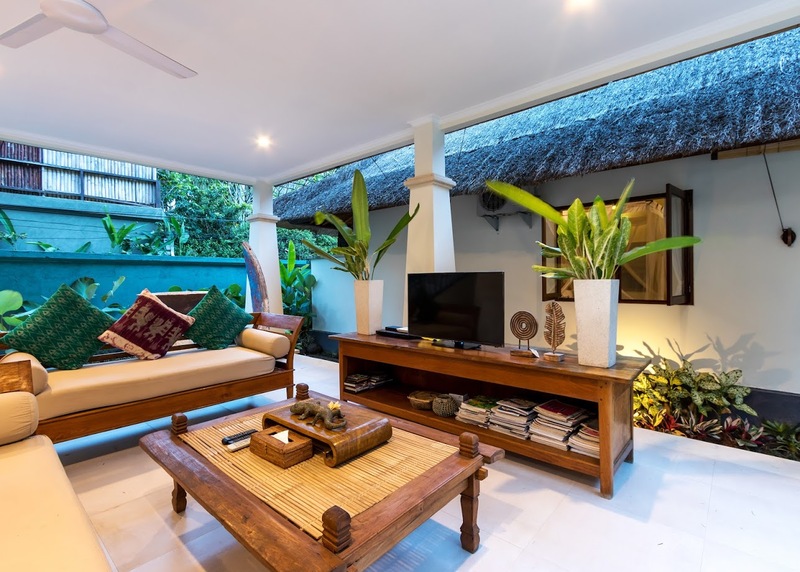 Located right by the ocean in a traditional Balinese village, you will get to see the ‘real Bali’ of unspoiled nature, friendly people and mystical ceremonies at the village temples. 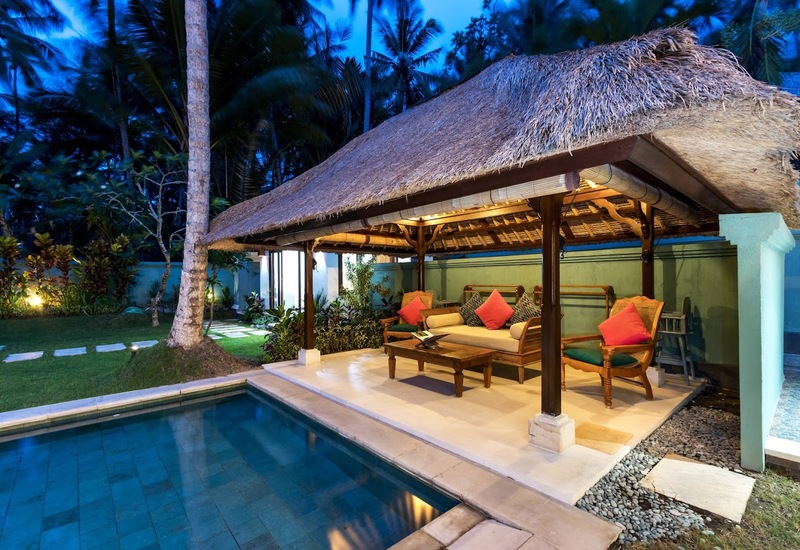 Mendira Beach is a wonderful place to go swimming or even snorkeling. 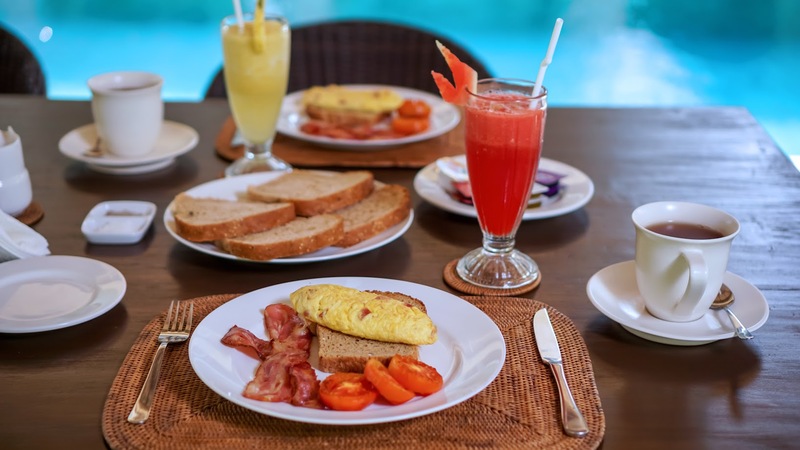 A short drive will bring you to the center of Candidasa, a popular yet quiet tourist town with some nice restaurants and bars. 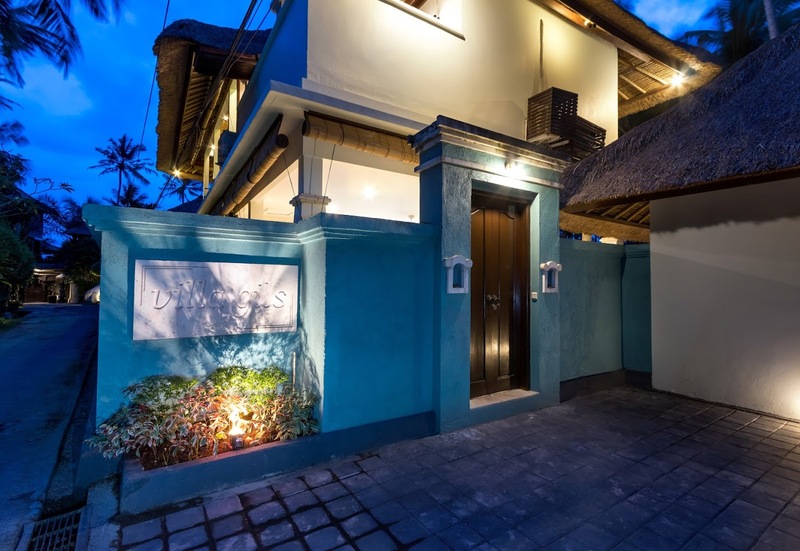 Vincent’s Restaurant is a nice Jazz bar where you can enjoy a lovely meal and wonderful jazz music, definitely worth a visit. 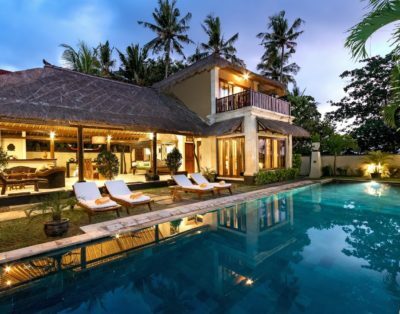 It takes around 1,5 hours to get to the international airport of Bali.